Is Ava Phillippe Dating Paul McCartney's Grandson Arthur Donald?. Beatles Radio: The Beatles, Solos, Covers, Birthdays, News The Fab 4 and More! Is Ava Phillippe Dating Paul McCartney's Grandson Arthur Donald? Move over, Brooklyn Beckham and Chloë Grace Moretz—there may be a new young power couple in town: Ava Phillippe and Arthur Donald. After stunning the world at Le Bal des Débutantes in Paris, many assumed Ava Phillippe, Reese Witherspoon and Ryan Phillippe's glamorous daughter, may have been interested in Maharaja Padmanabh Singh of Jaipur, who escorted her to the debutante ball. But it turns out she may have her eye on someone else. While on the London leg of the press tour to support her mom in A Wrinkle in Time, Phillippe and Arthur Donald, a grandson of Paul McCartney, were spotted heading to Sketch, an all-pink 18th-century tearoom turned cocktail lounge. 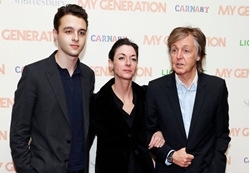 Arthur, the son of Stella McCartney's sister, the photographer Mary McCartney, recently left the United Kingdom for the United States to continue his studies at Yale. Phillippe has yet to announce which university she will be attending, but in July 2017 her dad told the hosts of Live! with Kelly and Ryan that she will be college bound very soon. Hopefully we'll get those happy campus move-in pics soon enough, just like we got with Malia Obama and Brooklyn Beckham.